The Koh-I-Noor Rapidoplot Archival Disposable Plotter Pen W-Style is an ideal drawing pen that can be used conveniently on paper, vellum, and drafting film. It features a two-part system that includes a nib and a pre-filled ink cartridge. It comes with black, permanent ink that are long-lasting for archival purposes. The water-proof and fade-resistant ink is perfect for producing high-quality plots. 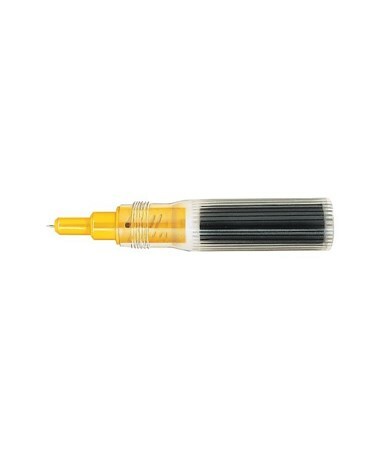 This W-style plotter pen is disposable. It offers the same excellent plots created with refillable ones minus the mess and the maintenance required. It comes in three different tip sizes: 0.25 millimeters, 0.35 millimeters, and 0.50 millimeters. This is to provide solution to a variety of plotting needs. The Koh-I-Noor Rapidoplot Archival Disposable Plotter Pen W-Style is direct fit for Calcomp 1023, 1042, 1043, 1043GT. It is also compatible with Artisan 1023, 1025; Artisan Plus 1023, 1025, 1026, 2024, 2036; Pacesetter 3024; and Designmate 4024 Classic, 4036 Classic. 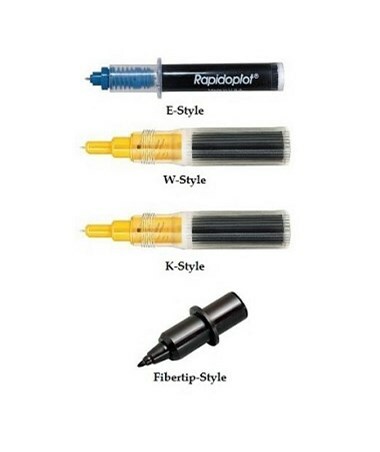 The Koh-I-Noor Rapidoplot Archival Disposable Plotter Pen W-Style comes in three tip sizes. Please select your preference from the drop-down menu above.